I got the original Gali figure because she was the lone female among all the Toa. She had a nice design and a petty cool translucent mask, and was just a good toy. Gali's conversion to Nuva has produced some mixed results. The silvery armor looks fairly good with Gali's blue construction, but the one-size-fits-all design is somewhat lacking. Gali Nuva still has a system of gears in her shoulders to swing her weapons or simulate swimming, though the set now includes extra gears and solid pieces so that you can also choose how you want to manipulate her arms. Want just one to move? Remove a gear. Want them both stationary? You can do that, too. The Toa Nuva have newly-designed legs that are smoother and broader than before. Gali has these new pieces for arms, as well, which hurts her design a little; turned around to serve as arms, the pieces look hollow and half-complete. The figure's weaponry has been updated - rather than the hooks she had before, Gali now has two aqua-axes and mini turbines mounted on her hands. One of the new features with the Toa Nuva is that their weapons serve more than one purpose; mainly, they can turn into a means of transportation. Plug Gali's axes into her feet, and you've got a pair of flippers to help her speed through the water. These, coupled with the spinning propellers, make Gali look rather like a living torpedo. The protodermis armor is cast from a shiny silver plastic (which is actually a translucent plastic that has a metallic dye suspended within). Plugging into the shoulders and chest, the armor looks like nothing so much as football pads. 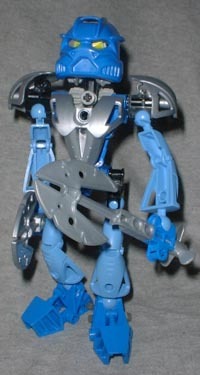 Gali looks just as barrel-chested as the other Toa, not as distinct and feminine as previously. Even the Toa's masks have gotten upgraded. No longer translucent, Kaukau Nuva looks nearly biological, and allows the user to breathe underwater for an unlimited time, even at extreme depths. In green it will look most like a frog, and in brown like a monkey. But in blue, however, it just has a somewhat aquatic look. 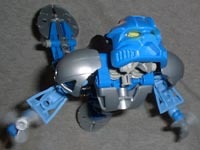 Bionicle is continuing the tradition it began last year with fun toys and an engaging story. The Toa have been updated, but Gali has lost some of what made her so special. Still, all props for being a lone woman in a man's world. Do you like the Bionicles, or are you a pinko commie? Who's your favorite? Tell us on our message board, the Loafing Lounge.